Immaculate Torrey Hills residence in the upscale gated community of San Raphael, in the heart of Carmel Valley. The home sits at the end of quiet cul-de-sac in one of the best locations in the community. The home is spacious and bright with 3 bedrooms, 2.5 bathrooms with features including hardwood, custom tile, plantation shutters, and custom white baseboards and crown molding throughout. The family room offers a cozy fireplace and large entertainment area and opens to the kitchen area. The gourmet kitchen has custom cabinets and beautiful high-end slab granite counters with full mosaic stone back splash, center prep island with bar stool seating as well as stainless steel appliances. The master bedroom suite boasts a walk in closet, large master bathroom with beautiful tile flooring, dual vanities, over sized tub and glass enclosed shower. The two guest bedrooms share a bathroom with dual sinks. The home also features a separate office area on the second floor, A/C and a second floor laundry room with front load LG washer/dryer. The home is equipped with solar panels (provides for minimal electric bill!) and wiring for an electric vehicle, and epoxy garage flooring. Attached garage with direct access to the home. The backyard is delightful with an open patio for outdoor furniture and BBQ. Common area amenities include: kid’s playground (Tot Lot), swimming pool, spa and recreation area. It is also in close proximity to walking trails on the nature preserve. No smoking. Pets OK with restrictions (maximum of two cats OR one small dog- less than 20 lbs). Schools nearby: Torrey Hills School, Carmel Valley Middle and Torrey Pines, Canyon Crest, and Cathedral Catholic High Schools. 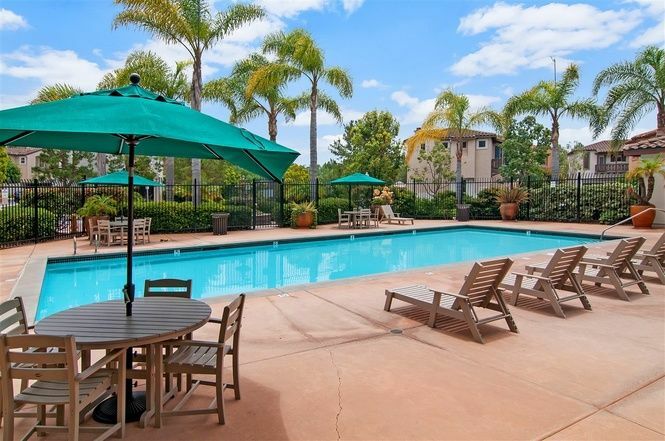 Commuting is convenient with quick access to Interstate 5 and 805, and Highway 56. 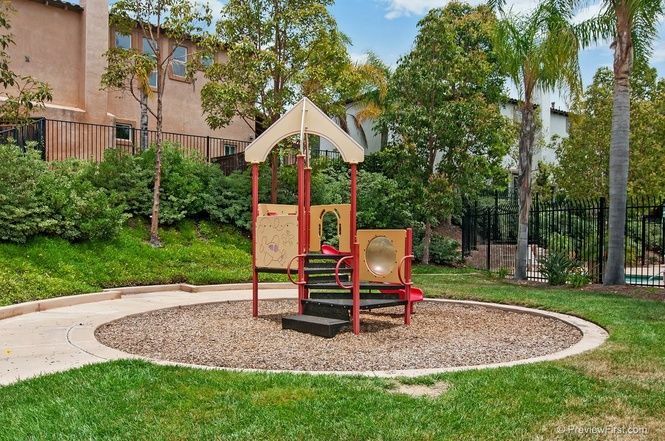 The property is further situated walking distance to shopping, grocery, and restaurants of the Torrey Hills area of Carmel Valley and is a quick to Del Mar village and beaches, Del Mar Highlands, UCSD campus, and Sorrento Valley. It is also a quick drive to San Diego favorites such as La Jolla, Del Mar race track and fairgrounds, Sea World, LEGOLAND, Historic Old Towne, the San Diego Zoo, Petco Park and the Downtown Gaslamp District. Trips to unspoiled Solana Beach or stunning Torrey Pines State Reserve and Torrey Pines Golf Course are also just beyond the neighborhood. Torrey Hills shopping center, Del Mar Highlands and Del Mar village. Torrey Hills School, Carmel Valley Middle and Torrey Pines, Canyon Crest, and Cathedral Catholic High Schools.